Codeine is an active ingredient in a number of over-the-counter medicines. The Therapeutic Goods Administration (TGA) has announced that from 1 February 2018, all medicines containing codeine will require a prescription. We can hardly believe it, but yesterday was their third birthday! 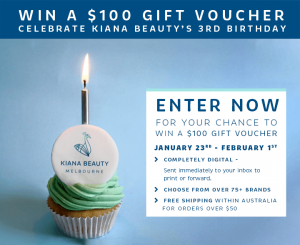 The Kiana Beauty team would like to say a big THANK YOU to all their customers who have supported them over the past three years, so they are celebrating with a voucher giveaway competition. We are calling on all Australians to help Ovarian Cancer Australia reduce the impact of ovarian cancer and improve the outcomes for women and their families living with this insidious disease. By hosting an Afternoon Teal event, you are helping your loved ones know the signs and symptoms of the disease and know their family history. It is estimated that road crashes cost Australia $27 billion every year. Since record keeping started in 1925, there have been more than 189,000 road deaths in Australia. 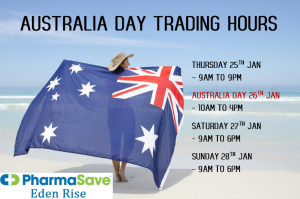 Looking to make a difference this year? Consider hosting your very own Big Red BBQ in support of Kidney Health Australia. Thank you for all of your loyalty and support in 2017. We hope you all have a wonderful 2018! !